Remember when I gushed about these prints? 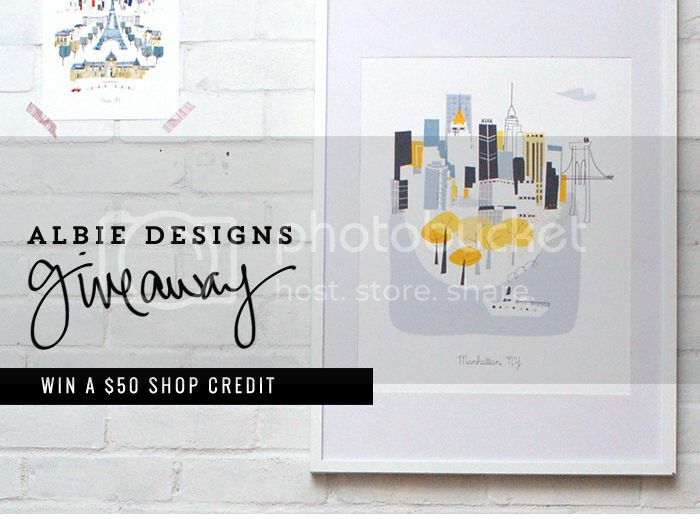 Well, the very talented Kim, from Albie Designs, wants to give a $50 store credit to one very lucky reader!! We all of have a special place in our hearts for a certain city. Whether it's your hometown, where you went on your honeymoon or a place you dream of visiting someday, Kim has a wonderful collection of fun illustrations of different cities all around the US and abroad. I'm still holding out for a Buffalo print, but I'm also partial to the Manhattan & Pittsburgh prints. Okay, ready to enter? Simply use the Rafflecopter tool below. Giveaway is open to all. Winning entry will be verified. The Manhattan print is my fave! Yay NYC! I love the Austin and LA city prints, but I'm loving the So Grateful one too! Such a fun giveaway! The Chicago print is definitely my favorite. I love the Chicago print! I have had my eye on the Manhattan city print for a long time!! I have a New York room in my house and want it so badly for that. I hope I win!! I love these city prints and she does have one of Denver! Yay! Fingers crossed!! so cute!! love the Sydney print! These are adorable! I like the Paris and Philadelphia ones! I like the San Fran one! I love the St. Louis print! The Chicago print would have to be my fav. The CHAMPS ELYSEES Paris print and the Manhattan, NY print are my favorites! OF course the Austin print would be my pick! !